Fallout 76 is neat. I’m sitting at about 15-20 hour of playtime. The final beta before launch was yesterday and it launches soon, on the 14th of November. It marks a departure from recent Fallout games (Fallout 3, Fallout: New Vegas, Fallout 4) with its stark absence of physically present non-player characters. Which I’ll admit is slightly disappointing… and, DAMN YOU BETHESDA! The bugs you’ve brewed up this time easily puts “bugs” a the top of my complaint-list for this game… But when bugs are the bulk of my complaints, I’d say Fallout 76 is off to stellar start! There are many things to enjoy with this game, and for me, there is enough to keep playing come launch day and beyond. 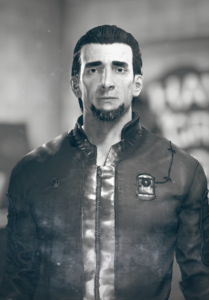 To get it out of the way: the only thing I’ll say on the issue of NPCs is if the trend of Bethesda’s character design had continued logically from the foundations laid by Fallout 4 the results were guaranteed to be worse than no characters at all. Yes, I find Fallout 4 THAT bad! 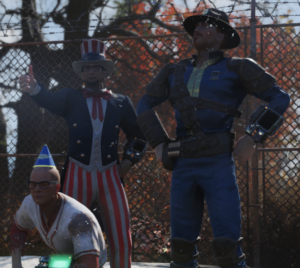 Not to mention, Fallout 76 isn’t 100% devoid of friendly NPCs. To clarify, though, the issue is more that level of interaction with the existing friendly NPCs is limited and not dialogue-based, which has been the standard method of conveying a story for ALL of the previous Fallout games. The experimental method Bethesda took has given Fallout 76 a unique feel that remains sufficiently interesting for solo-exploration, and by extension co-operative exploration. And I’ll surely stress my emphasis on the word sufficient everytime I address this issue, but If a game like this can make a player like myself – who decided out-of-the-gate to focus completely on the base-building and crafting aspects of the game – can get lost in the environment, end up sinking time into thorough expeditions, and subsequently left me wanting for more exploration despite that all I set out for was just a feeeew essentials on my base-building shopping list, then I think it’s fair to say the experiment is working for me, at least throughout my initial 15-20 hours. Before playing Fallout 76, I had my hand on the trigger, ready to dissect this game and everything wrong with Bethesda to find cause for their decreasing standard of game design, but after playing, even if I’m not completely swayed, I was forced to consider my own hypocrisy. Isn’t experimentation, risk-taking and breaking the mold something we’re constantly asking AAA Developers to do? As I mentioned, I completely dedicated my time to the base-building and crafting. It is a successor and a significant step up from the systems presented in Fallout 4, and when it isn’t nerve-wracking or bug-ridden, it’s great! It’s hard to say if Fallout 76 competes with the modded base-building of Fallout 4, but it surely contends. Fallout 76 includes two types of bases that I’m aware of. Your C.A.M.P. is the first type you’ll encounter, as you get it almost immediately upon leaving the Vault. Similar, in lore and function, to the G.E.C.K. (Garden of Eden Creation Kit), it is a versatile and easily relocate-able module that delivers the necessary tools, resources and technology to rehabilitate areas in a post-apocalyptic wasteland. In this case, however, the C.A.M.P. relies more on mechanical and structural methods to pave new settlements in the wasteland, and is less reliant on “terraforming” or chemically tailoring the elements of the wasteland to compliment the unaltered human biology as the G.E.C.K was…. it also enables base-building in a decently sized circle with the module at its center. I’d like to see the G.E.C.K. do that! Possibly the best thing about the C.A.M.P. is how much freedom is allowed in placement. I was expecting extremely limited, specifically placed, phase-based zones where you (and your comrades) would set up, along with every other group in the virtual wasteland and raiding was some sort of matchmaking. I was wrong! Players can pretty much place that thing anywhere provided its building area doesn’t intersect with a point of interest or another player’s base. Even with these restrictions you can manage placement that is pretty close, if not nestled squarely within, your favorite locale for a wasteland-wonderland. One of the earliest “inspired” wasteland bases I stumbled upon was an old, re-purposed gas station, in a way re-rendering the station you see in Fallout 4. And instead of relying on a shoddy phasing system to side-step the difficulties of persistence, they instead avoid the entire concept of persistence! Everything you build will remove and refund itself as soon as you log out from the game world and to mitigate the tedium of rebuilding your perfectly designed base every time you log in, there exists a blueprint system to save your builds. Smart! After everything good I had to say about it, it is a shame the C.A.M.P. doesn’t have more going for it. The second type of base is unquestionably more impactful and rewarding to invest in. I only know the location of two of these types of bases and both are at power-plants, but I have my hunches about where other sites might be — and, no, the hunches do not include other power plants, although I’m sure the other power plants have Sites too! There are a few details that set Sites apart from the typical C.A.M.P. bases. First, the HUGE build area.. there is no comparison between the two base-types in regards to build potential. The Sites include a build-area and proportional prop-limit that gives the impression that you can completely fortify it, from corner to corner, turning it into a CONVINCING and DEFENSE-ABLE BASE. Don’t worry, it delivers! Second, is that these Sites have ready-access to a variety of resource nodes. These resource nodes aren’t unique to Sites, you can find them out in the open-world and even plop down your C.A.M.P. nearby to build a harvester on the node, but, the Sites still out-pace any C.A.M.P. because they are guaranteed to have a set amount and type of resource nodes with the addition of a special resource. At my Site, located immediately West of the mountain range that separates the arid plains from the lush woodlands and due East from the starting Vault as the bird flies, the Monongah Power Plant included nodes for Silver, Acid, Wood, Nuclear Material aaaand.. a generator that produced Power Armor fusion cores. All I could think, especially since this was only a few minutes after I found my first set of Power Armor, is, “This will come in handy!”. The last difference of note about Sites is that claiming them comes with an associated risk: other players are able raid your Site and claim for their own, and if you think this fact will fly under the radar because no player happen to be nearby, well thank again! There is server-wide announcement that reveals when you are claiming the Site and another after you’ve officially claimed it. Luckily, during the beta I went about my base-building-business unmolested, but come release day, when players aren’t so consumed with making the most of their beta-time by grinding or exploring, I expect to spend more time warding off envious, would-be settlers. Upon arriving at the Monongah Power Plant, I was prompted with an Event to reactivate the Power Plant. At first, I didn’t even consider doing the event, but after awhile I doubled back as this was likely a great area to find the specific materials to build up my C.A.M.P. nearby. The Event was straight-forward and required me to run around the power plant repairing the broken pipes and machines that controlled the plant. Once all of it was repaired I went to the main console of the large facility and activated the power plant. And it worked! No convenient plot that messed with my expectations. The power-plant just turned on as expected. Then I noticed, sometime during the event I picked up a quest that wanted me to go and claim the Site located outside in one corner of the facility. As it turns out, I didn’t need to complete the Event to enable claiming the Site, but completing the Event did offer the promise of increased power output from these three wall-mounted power units distributed around the Site. I say promise because, aside from the first time I did this Event, the power nodes never increased above the measly 10 Energy they provided by default. And every time I completed the event, the amount of power delivered by the units was irrelevant anyways, because I was unable to attach a wire between the unit and anything else. I did mention there were aggravating bugs! It was a small bump-in-the-road, however, for my Fallout 76 experience. And I was still fresh and determined to power on. Through building up my base, first prioritizing the crafting stations before anything else, then of course the defenses to protect against all the players that never contested my claim and gathering items to scrap for resource with the time in-between, I slowly unlocked more and more plans. Plans are the base-building schematics for props, tools or machines. Fallout 76 struck a pleasant balance with how its different feature tugged at my focus. Here I was, base building and slowly-but-surely getting rewarded with Plans, which allowed me to reinforce my focus on base building and caused longer periods of time to pass before I hit the inevitable “tech ceiling” that forced me to stop and start exploring or progressing. At the start of each beta session, I immediately began setting up the essentials for my Site. As a point of practice and testing, I still completed the generator event each and every time, despite it never once working as intended. At the very least it was a source of EXP and resources which was enough for me. After that I’d go to each of the resource nodes and plop down a harvesters alongside a generator. Each resource harvesters requires 10 Energy to run, save for the water harvesters, which varied in Energy requirements every tier, but took 8 Energy at the lowest tier. Then, like clock-work, by the time I had done all this the first “Defense Event” appeared for my Site. Defense Events are short missions that require you to kill waves of enemies that are attacking your base. The Event gives you a bit of time to prepare and the waves are staggered to offer even more prep-time between. The amount of waves, types of enemies and their levels vary wildly every time, and usually in the later waves Elite-versions of the respective enemy-type will appear. In my experience, the Defense Events started appearing shortly after I claimed my Site (within 5-10 minutes) and are decently spread out thereafter, by about 30 minutes to an hour between each occurrence. You can ignore the prompts to defend your base and you won’t lose your claim over it, but doing so results in your Site being infested by the attacking enemy type and you’ll need to clear them out before you can enter build mode on the Site. Weighing amount of effort using time invested as a metric, it is significantly quicker to clear out a Site AFTER it’s taken over as you don’t have to deal with multiple waves of enemies, but ultimately you get less by taking the quick-and-easy. Doing the Defense Event when it appears and seeing it through to the end gives you a good chunk of EXP, resources, and the high probability of Building Plans or unique gear. Building structural and automated defenses helped to complete these Defense Events with less time and effort, but some of the enemy types proved challenging despite defenses, and I have little doubt that the type of enemies that gave me the most challenge will not be what you expect. Super-Mutants? Nope! In fact, I found Super Mutants the easiest to dispatch, aside from the iconic mole-rats, once I considered each enemy type. Super-Mutants are slow, lumbering and have heads purpose-built to catch high-caliber bullets. Deathclaws then?! Well, to be honest, I was never attacked by Deathclaws – I don’t find this at all disappointing… So nope, not those either. And to avoid going over them all, as rule of thumb if the enemy-type carried guns, they were easier to deal with. Typically creatures able to carry guns indicate a higher level or that they’re more intelligent than the average wasteland creature. But instead of delivering a larger threat than the simpleton creatures of the wasteland, they stayed more focused on you and remained squarely in your line-of-sight despite this tactic leaving them wide-open to turret fire and my own, and as it turns out, the most challenging enemies were the small-buggers and the quicker-buggers that lacked ranged weaponry. The small-buggers – formally Radrats – are similar but markedly-different from their molerats cousins. Are they cousins? I dunno’. They spawn in such numbers and are quick to go after automated defenses, and in my case, even shredding the turrets that I tried to keep out of reach. They were smaller than molerats – hell, small even by mutant standards – but due to their small size and agile nature my turrets were hardly able to damage them before their destruction. Then, with nothing actively shooting at them, they either came after me or spread out to take down the rest of my crafting stations and harvesters. They are tough to hit when they’re attacking you directly, but they don’t do tons of damage and they die fairly quickly given that you take the time to line up your shots. They also don’t have the habit of going straight for you, instead preferring the tasty minerals of your buildings and machines; In reality I think they tend to go for structures because it is easier for the player get outside of their reach due to their small stature and lack of ranged attacks, and the fact that other enemies exhibit the same behavior when you get outside of their melee range only further supports this theory, but I’ll continue to imagine them as voracious, metal-eating, mutant rats. What gives Radrats a special note among other pests, however, is that they will destroy your stuff quickly and it’s all but inevitable in the early game, even if you manage to quell their numbers out of the gate. The quick-buggers – better known as Feral Ghouls – play somewhat foil to the challenges presented by Radrats. They are human-sized and tend to swarm you directly rather than going for machines. Of course, if you jump up on something to keep out of range, they’ll leave alone… only to scurry off to take out your valuables! And in my case any structures that I had to keep me sufficiently out-of-reach also put me in a sore position to shoot them when they switched their interest. As it was, my machines were hidden from my line of sight and every time I’d step down to reposition the buggers were eager to swarm me again. Similar to the Radrats, they were fast and attacked in large numbers but, unlike Radrats, they did a lot more damage and easily threatened to take all of my HP if I was anything short of clever about dividing them into groups. Their sporadic movement made it difficult to land solid hits on them, and because their animations made their heads move rapidly, it meant that shooting their chest was usually a more consistent option. To make hitting them more difficult, they have a speedy charging attack and if any of their melee hits land, it staggers you and severely degrades your ability to aim straight. If they hit you enough, the risk of fracturing a limb increases and those quick-buggers always go for the legs. Once your leg is crippled, it doesn’t matter what level the swarming ghouls are, if there is at least three of them left, you are guaranteed to be slowly walking or walking dead. What helped, as I suggested before, was to cleverly divide them up in a way that I was never fighting more than three at once, and a neat trick was to shoot them as they started their lunge/charge attack which knocked them out of the charging animation and put them into a stagger animation, opening a small window that was big enough to squeeze in a second shot aimed directly at their heads. Oohh yes, I was getting pest-control down to a science. But that didn’t protect me from pesky bugs along the way… occasionally during these attacks the enemies would get distracted by things far away, long before reaching my base-proper, making it all-but-convenient to track them down and finish them off. Sometimes it was other enemies that found the pest as unwelcoming as I did, but most of the time the source of the distractions were more obscure. The biggest repeat offender was one of the wall-mounted power nodes, which had a wire connector a few feet above it where you’d, presumably, link up to your own machines with wiring. Of course that didn’t work, but that didn’t stop the attackers from finding an.. interesting position to get at the thing. They would keep gathering up on this walkway overhead that put them riiiiight in melee range to smack the connector. Took me awhile to figure this out, and then-on-out clearing them was surely tedious, but no longer a mystery. This alone was not a terrible inconvenience, and the circumstances that caused the bugs usually made perfect sense. But on an occasion or two, there was the absolutely infuriating bugs where the enemies became distracted with things that I never ended up tracking down and remain mysteries to me. Not for lack of trying, though! I combed every inch of the area around my base, top to bottom before giving up. And eventually since I failed to clear the enemies out, they took over my Site and I was STILL unable to find them, which locked me out of building entirely. I was forced to abandon my base, not able to recover a single thing because I couldn’t enter build mode to refund, and start over. All-in-all, though, the crafting and building were wonderful investments, and I’m eager to pick up right where I left off. The other aspects of the game were also satisfying and made plays for my attention, but I was able to approach them on my terms and was never rushed or pigeon-holed into a particular type of gameplay. Frankly, I can’t say this for any other Fallout game, besides maybe the originals. While I avoided direct player interaction for most of the beta, I still had my moments. I started out at the same time as a few other players and the three of us made fast-friends, spending the first few hours exploring and learning the game together. The more sporadic, unplanned interactions were mostly peaceful and didn’t distract from the world at large. There were certain players that I think added something special to the world by acting through crafted personas, and as for myself, I filtered the outward behavior of my character through the lens of a new-age, “Abraham Lincoln” simulacra named Adam B. Abraham. 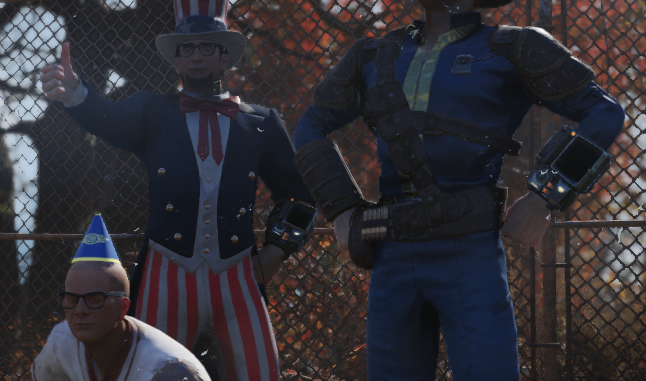 And so it was, determined to rebuild the foundation of the United States and ensure the absolute freedoms of all the wasteland’s denizens, Adam set out to build his City-Upon-The-Hill. Exploration was a treat! Though I ignored pretty much all of the holotapes – listening to someone talk for extended periods of time didn’t, at all, compliment my expeditions. The holotapes played like monotonous records drowning out whatever I was focusing on at the time and never kept pace with me. There was one holotape I remember vividly, a recording of a man trapped inside a refrigerator desperately calling for someone to let him out! I listened to him for felt like five-minutes, while exploring a relatively peaceful town. After that “five minutes” the holotype did provide clues of where to find some loot – the refrigerator man’s most valuable possessions in exchange for letting him out – but I didn’t even bother. The time I spent listening to holotapes was not worth the information they provided, even when that information directly translated into resources. But, despite rejecting the holotapes as a medium to tell a convincing story, there were plenty of other sources of theme, flavor and setting to fill the gap. For me, reading the computer logs, hand-written notes and deciphering the stories painted by the classic still, visual-only scenes that are iconic to Fallout, was enough to feel satisfied with every area I explored. The graphics were on par with my expectations for a Fallout game, which is to say they were okay, but there were times where they did manage to sneak in some surprisingly spectacular scenes. If there is anything about exploration for me to complain about it would be the constant lack of healing supplies and ammunition I experienced, which didn’t feel as balanced as in my play-throughs of other Fallout titles. Fallout games usually supplied just enough to not feel starved for resource, but Fallout 76 has me constantly pushing forward with only bread-crumbs to shoot with!! I figure this had a lot to do with my perk setup and general focus of gameplay and I can imagine that once I get the Recipes for more healing supplies, like Stimpacks, regular access to the resources I need to make my own ammo, and of course a more balanced Perk setup, that this problem will all but disappear. While pleasantly surprised, I still fear this game will not be as re-playable as previous titles and expect the shelf-life of this game to be significantly less as a result. Something I find about multiplayer games is that, unless they’re exceptionally designed, the gimmicks that drive progression and player-interaction either quickly tire themselves out or they stay fresh for ages, with no room in-between. And I doubt the bugs are gonna get ironed-out any time soon… even towards the end of the final beta session I found myself adding more and more to my bug-list with less than a week left before launch. But, for all the negatives there are overwhelming positives and a clear, honest attempt to design unique and interesting mechanics to drive the game’s experience. I never even touched on all the other things this game has to offer: Perks, Mutations, Diseases, Nukes, etc… you should definitely take the time to look them up. 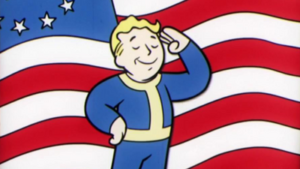 There is certainly enough to keep me playing for now and time will tell if the Fallout 76 experiment is a overwhelming success, embarrassing failure or something in between.